Another Top Rank card on ESPN is in the books and the fans who attended at the Grand Sierra Resort and Casino in Reno, Nevada were treated to a great fight in the main event. On the undercard, the A-sides to each bout delivered in expected victories as Heavyweight contender Bryant Jennings (22-2, 13 KOs) demolished an overmatched Akhror Muralimov (16-4) in just three rounds. Also, U.S. Olympic silver medalist Shakur Stevenson (5-0, 2 KOs) scored a wide unanimous decision win over Juan Tapia (8-2, 3 KOs) in what was his first scheduled eight-rounder of the 20-year-old’s 10 month pro career. In the co-featured bout, the “Mean Machine” Egidijus Kavaliauskas (19-0, 6 KOs) defeated his most notable opponent to date by stopping former world champion David Avanesyan (23-2-1) in the sixth round. The bout started out slowly as Kavaliauskas slowly but surely broke down Avanesyan with big counter power shots, rocking the former champion with hooks and overhand rights. The mean machine was simply too strong for the Russian fighter as referee Tony Weeks was forced to put a halt to the bout after consecutive unanswered blows were delivered to the head and body of Avanesyan. 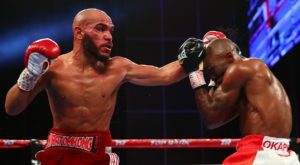 Finally in the main event, Ray Beltran (35-7-1, 21 KOs) was a heavy favorite to pick up the vacant WBO lightweight strap against 39-year-old Paulus Moses (40-4, 25 KOs). However, it was a much more difficult than expected for Beltran as Moses withstood the early onslaught and began to gain confidence as the bout progressed. The Nambian fighter started to gain momentum in the middle rounds opening cuts on both of the eyes of the Mexican fighter with an accurate jab and big straight right hands. Despite fighting with cuts over both eyes for nine-plus rounds, Beltran dug deep and got a second wind in the last quarter of the fight as Moses began to tire. Beltran closed the fight strong establishing more distance between himself and his opponent, getting tagged less, and scoring several power shots of his own. The late rally seemed to seal the deal for Beltran as he was awarded with a comfortable unanimous decision win. The Mexican immigrant won the WBO lightweight title in his fourth attempt as his ongoing pursuit for a green card may finally come to an end.